Describing the area as a “pu‘uhonua” for families, Hawai‘i County Mayor Billy Kenoi and other dignitaries untied two maile leis Friday morning, signaling the opening of an affordable housing project and a 12-acre community park in Waikoloa. Kamakoa Nui, which targets first-time home buyers who make a little less or slightly more than the area median income, will eventually consist of about 1,200 fee-simple homes and rentals on 268 acres just north of Waikoloa Elementary School. About 50 people, including government officials and private sector representatives, celebrated with the county under blue skies, brisk winds, and the island of Maui dominating the sweeping views from this community, which will feature three-bedroom single-family residences and two- and three-bedroom bungalows. 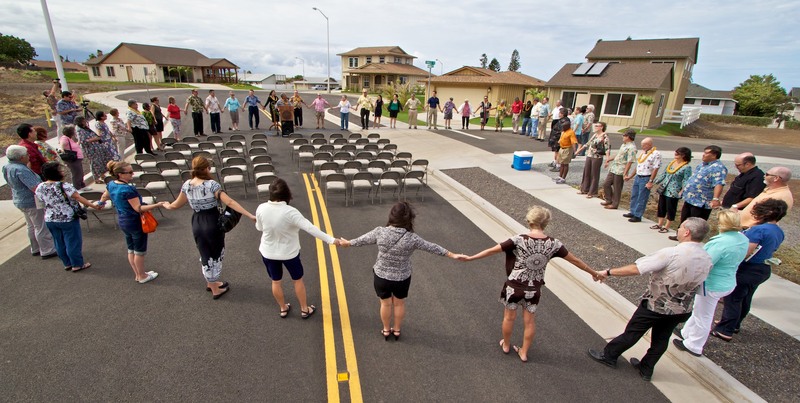 About a half an hour prior to Pastor Sonny Shimaoka’s blessing of the $44 million Kamakoa Nui, the same group celebrated the opening of a new public playground a few hundred yards away from the set of four model homes which will serve as a sales area. Homes will range from $240,000 to $325,000. Sales of the first increment of about two dozen homes should begin next month and will be marketed by Aldrich and Associates. Arnett said Kamakoa Nui was handed to the Kenoi Administration three years ago “under a dark cloud” with the project stalled, under legal scrutiny and with much higher projected home prices. “Our group spent countless hours trying to make the homes more affordable,” he said, crediting his staff of (East Hawaii supervisor) Jeremy McComber, (housing specialists) Dan Russell and Mike Prinslow and (private secretary) Annie Bailey with finding a way to cut costs. Mayor Kenoi said the Office of Housing has succeeded in filling many gaps in West Hawai‘i’s housing inventory. Along with the affordable Kamakoa Nui, the county will next week open the doors to the $12.4 million Kaloko Transitional Housing Project, with 12 units to get homeless families off the streets, and 28 units for low-income households. Last year, the $1.8-million West Hawai‘i Emergency Shelter was opened, providing 30 beds for homeless men and women. Mayor Kenoi also cited the Lokahi Apartments, affordable rentals developed by Pacific Housing Advisors. To qualify, buyers should live within a 30-mile radius of Kamakoa Nui and have an income between 70-120 percent of the area median income (AMI). Potential buyers must also live in the homes and cannot have owned a home within the last three years. To discourage speculation and help to keep the units affordable, owners who re-sell their units at Kamakoa Nui within 15 years of their initial purchase will be required to share any windfall profits from the re-sales with the county. After 15 years, all restrictions on re-sales are satisfied.